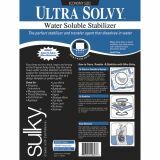 Ultra Solvy Water-Soluble Stabilizer - SULKY OF AMERICA-Ultra Solvy Water Soluble Stabilizer. 19-1/2Wx 3 Yards. Heavyweight, translucent color. 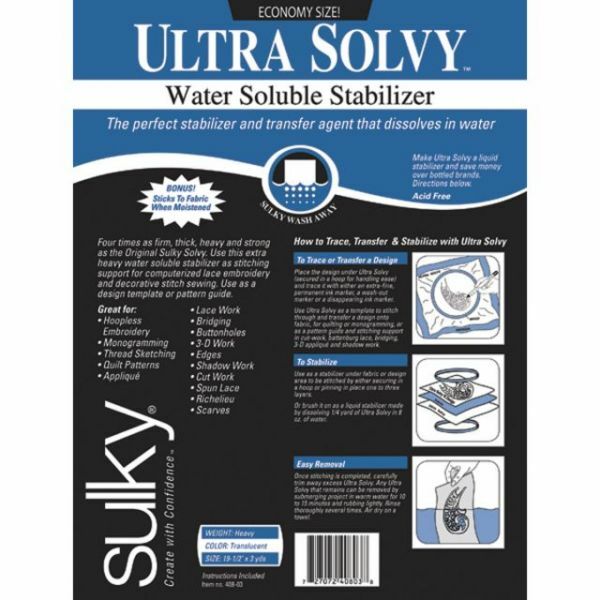 The perfect stabilizer and transfer agent that dissolves in water like magic! One layer has the strength of 4 layers of Original Sulky. Perfect for heavier applications of thread as well as large, complicated computerized embroideries. Also, because it is clear, you can use it as a design template or a pattern guide. Fun for hoopless embroidery: moisten top with a damp sponge (sticks to fabric), let dry then embroider! Extremely firm and stable.